Emory's Nell Hodgson Woodruff School of Nursing was ranked 10th in the nation, based on new statistical and reputational data introduced for the first time this year by U.S. News. Several of Emory University's graduate schools and programs are ranked among the best in the nation, according to analysis and surveys released today in U.S. News & World Report's 2016 edition of "America's Best Graduate Schools" guide. Emory's schools of business, law, medicine, nursing and public health were the top-ranked schools in Georgia in their respective categories, and several other Emory schools and programs were newly ranked this year. Emory's Nell Hodgson Woodruff School of Nursing was ranked 10th in the nation, based on new statistical and reputational data introduced for the first time this year by U.S. News. 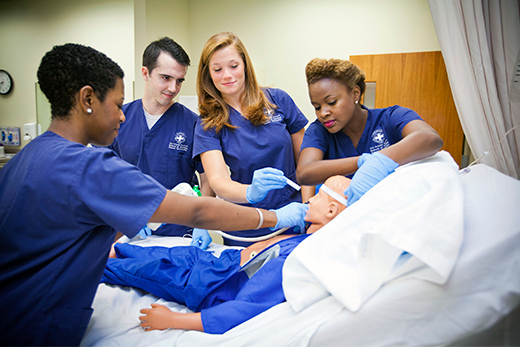 Previously, the magazine ranked master's programs in nursing only every three years, based solely on peer assessments. "This year's U.S. News and World Report ranking validates the strength of our nursing programs and our commitment to developing outstanding nursing leaders," says Linda McCauley, PhD, RN, FAAN, dean and professor of the nursing school. Emory Law School ranked 19th in the nation. Goizueta Business School's full-time M.B.A. program was 21st, its part-time M.B.A. program 15th. The School of Medicine was 23rd nationally among research-oriented medical schools (the highest in Georgia), and 42nd among primary care schools. The Rollins School of Public Health ranked 7th in the nation. Emory's and Georgia Tech's joint Department of Biomedical Engineering Ph.D. program ranked 2nd in the nation for the ninth consecutive year. Emory's physician assistant program ranked 3rd in the nation. "Emory's graduate and professional programs across the board benefit from the fact that we are a research university with the liberal arts at the center," says Claire Sterk, provost and executive vice president for academic affairs at Emory. "Our students have opportunities to work closely with scholars and researchers who define and transform their fields, ensuring that Emory graduates will continue to lead changes that contribute to the common good." U.S. News first published a reputation-only graduate school ranking in 1987. The annual America's Best Graduate Schools report began in 1990.